Made in Ausburg, West Germany in the 1960s and 70s, Asbern presses have a fixed bed and rolling carriage. They feature a dial for incremental height cylinder adjustment to change the impression and a lever for manual cylinder trip mid print stroke. Three models were imported into the U.S. by E.G. 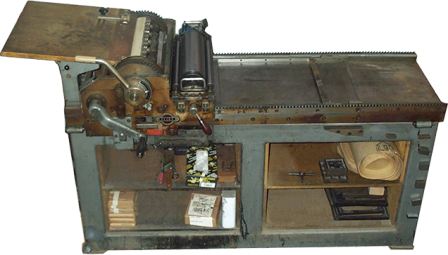 Lindner Co., a printing equipment dealer in Los Angeles. Ernest A. Lindner co-founded The International Printing Museum. Models AD-1 and ADR-1 have hand-cranked carriages and power ink distribution. Some AD-1s have manual ink distribution. The PI-1 has power ink distribution and a wash-up unit, similar to the Vandercook Universal and SP series, and two gripper opener cams for short or long print strokes, similar to the Vandercook Universal series. The Asbern census lists 30 presses worldwide. There may be more in Europe.